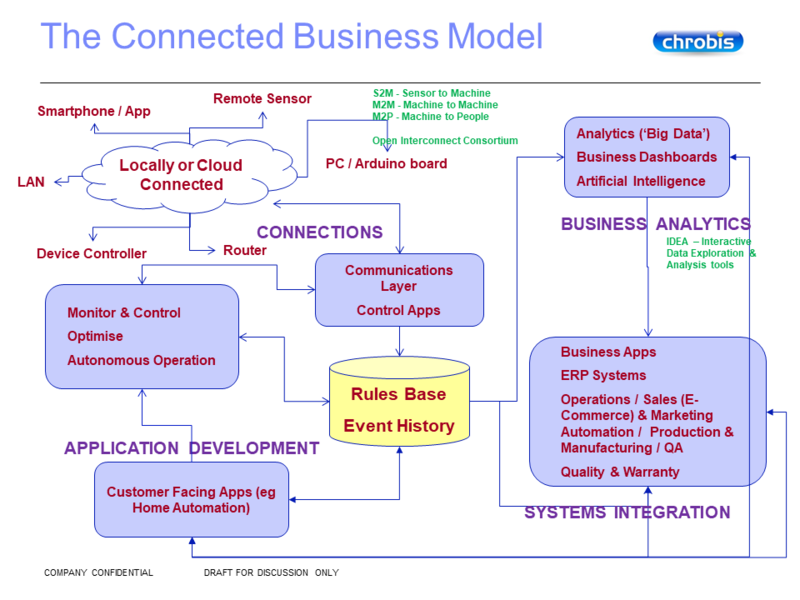 This ‘simplified for presentation’ diagram shows an outline business architecture for integrating IoT devices into a business application, that goes beyond the initial gathering of data, to turn information into business intelligence using cognitive software. Gathering data presents its own set of challenges, generally related to accuracy, volume and velocity of data. To drive business value, interpretation of it into sensible implications, and integration into underlying business systems is required. The technical platform supporting this business architecture must be capable of handling the data variety, volume and velocity appropriate to delivering the business case – capturing the right data, at scale and with appropriate timeliness. Depending on the circumstances, there is a class of tools emerging that can provide a solid base, or it may be necessary to develop your own, in what can easily become the classic ‘build vs buy’ debate, set against skills availability in your resources. Viable Process Automation and Internet of Things platforms are emerging, relevance requires judgement in different circumstances to identify a feasible approach. We only develop bespoke software, to address the circumstances of each client, and avoid attempts to ‘shoehorn’ what can be a unique set of specific requirements into any pre-existing model of business or technical architecture. Every set of circumstances is different. To get started with your project, or simply discuss your ideas, call us on +44 113 242 3795.